Measurements: 2.77 x 4.75 inches, or 70 x 120 mm. Back of card: Solid pale green, with a simple thin white line border .3", or 8mm from the edge. May be inverted. Book included: Yes, small: 95 pages, 2.76 x 4.74 inches, or 70 x 120 mm. Text, in English only, by Juliet Sharman-Burke. Also included: 8 colored pencils: Black, brown, violet, blue, green, yellow, red, orange. Each: 3.4 inches, or 8.7 cm long. Publisher: Connections Book Publishing, London. Printed in China. 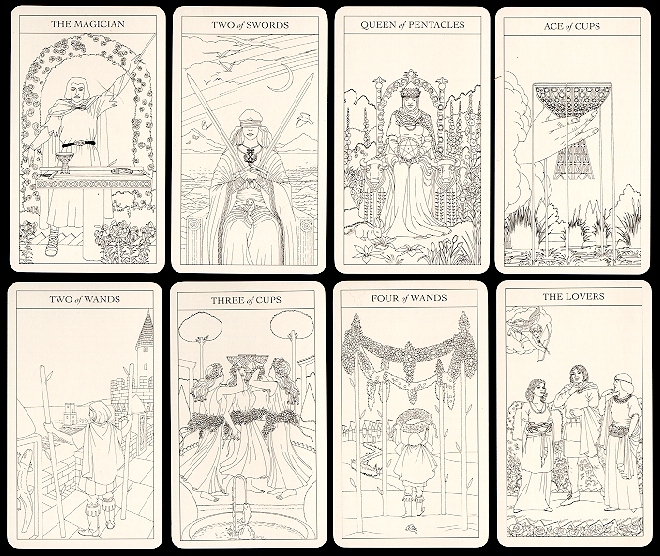 Descriptive text in the book is extracted from Beginner's Guide to the Tarot, and, Tarot Workbook, both published by Connections Book Publishing. Also included are instructions for coloring the cards, as well as suggestions for individual cards. For each card, there is also a small space for a journal. This deck is also part of The Complete Tarot Pack, where you will also find the cards from The Beginner's Guide as well.